Dr. Picard now uses advanced digital technology in his practice to evaluate patients' postural health. The AssociateTM, an electronic scanner developed by the nation's leading orthotic (spinal pelvic stabilizers) producer, Foot Levelers, Inc., was recently installed at Picard Chiropractic. The new scanner enables the doctor to screen for foot imbalances that affect overall body function. This technology helps chiropractors develop care plans and use postural support for improved results. With the AssociateTM, Dr. Picard has the ability to produce colorized weight bearing images of the feet to detect pronation or supination, excessively low or high arches, and other foot abnormalities that may lead to gait dysfunction. This digital picture helps to explain how foot imbalance leads to distortion of the spine. Common noticeable postural faults, such as an unlevel pelvis or shoulder height discrepancies, can be the result. Care for these conditions include a three-phase approach of chiropractic adjustments, the use of Foot Levelers' Spinal Pelvic Stabilizers, and neuromuscular re-education through rehabilitation. 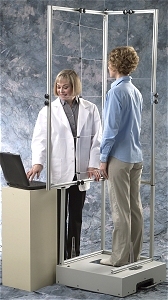 Additionally, the doctor can provide patients with easy-to-understand reports of their postural examination. Dr, Picard welcomes new patients to Picard Chiropractic for postural exams to determine their Chiropractic needs. This clinic offers a variety of therapies for acute and chronic musculoskeletal conditions and spinal health. The doctor also provides on-site screenings with the AssociateTM at corporate health fairs and other community events.